and the rest of the month will be just as busy! You all made it that much more Special! and I am so very thankful for his Joy! Satan wants to try and rob you of that Joy you have. Well, he's not taking my Joy! I hope you all have a Glorious week!! I choose JOY too! Wishing you many blessings this week. I must say I also feel very tired today, but I will not allow His Joy to be robbed from me. This is a very good reminder! 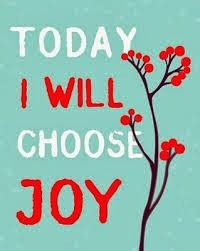 I also choose JOY! I love the title and message of your post... it really is a choice isn't it? And I do choose it. I believe it is one of the ways we win the battle;the victory is at hand as a result of that choice. We had such lovely time at your house on Sunday. It was very special to all of us and Steve was honored to be a part of Clayton's birthday in such a way. The food and fellowship was wonderful, and Winston hasn't stopped talking of his great adventure. Thank you for being such a blessing to our family. Thank you, sweet Amy, for this beautiful reminder to have JOY :) Yes, I choose joy! Blessings to you, friend. Sending hugs your way.